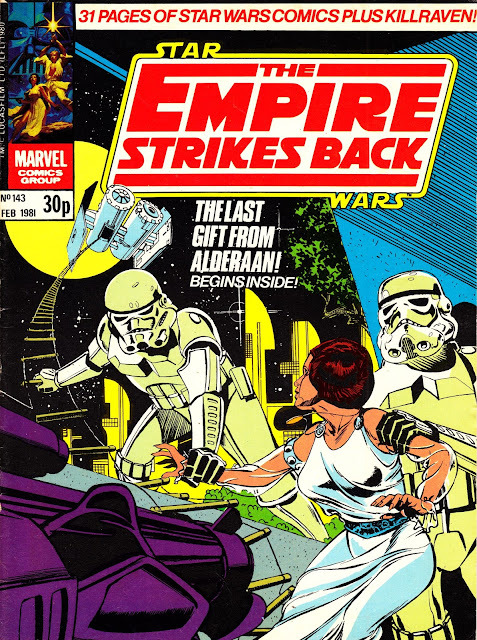 From February 1981: another excellent cover from the British STAR WARS: THE EMPIRE STRIKES BACK MONTHLY, published by Marvel UK. This issue reprints Number 53 in the US run, with a new cover which isn't a million miles from the US design but manages to be more dramatic and makes Leia less of the passive victim. The appearance of the double-bodied T.I.E Bomber created something of a playground thrill back in the day. although it does seem a bit implausible that a rickety looking rope ladder would hold the weight of two ' enormous stormtroopers ' plus the princess. this story was actually a re-worked john carter tale and it shows in the more outlandish elements.